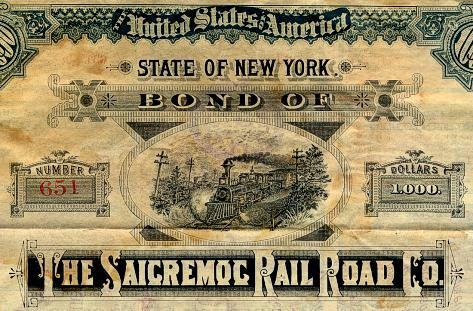 Beautiful RARE Specimen certificate from the Saicremoc Rail Road Co issued in 1886. This historic document was printed by Corlies, Macy & Company and has an ornate border around it with a vignette of train rounds curve and passes telegraph poles. This item is over 122 years old. Some age related wear/stains. Salesman's sample certificate (fictitious company name, not a valid railroad company. Bond says New York on front and Taylor County, West Virginia on back, vertical format, coupon, 6%, 1886, due 1901. 30 coupons attached on top.